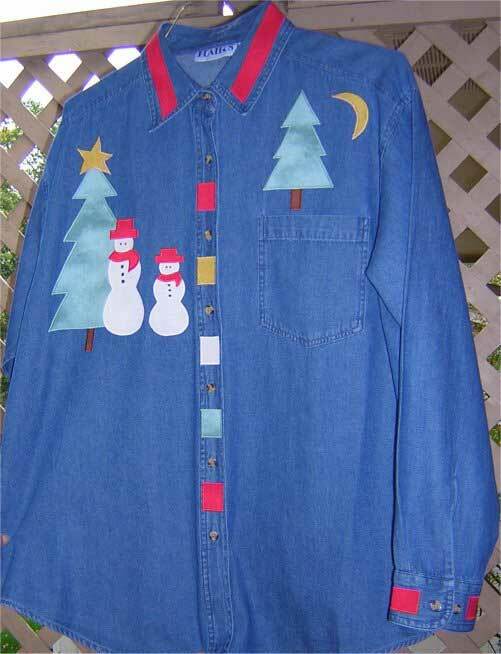 Use these charming Christmas characters to add holiday cheer to any shirt. They also would be great to add to your Christmas stocking or added to a holiday banner or wall hanging. Choose scrap fabrics from your stash that coordinate with your shirt. You'll need to prewash a new shirt before applying the appliqu?s to avoid shrinkage. Just iron on your designs with Wonder Under and stitch around each shape with a zigzag stitch to prevent fraying. You've changed a ho-hum shirt into 'let's party' glad rags with this fast and simple project.